For light eyebrows, it is better to use a powder product to fill them in, as it can be used a lot lighter than a pencil or gel, so it will look more natural. It’s actually kind of your choice. You should choose a good quality brand. If you go to department stores like Macy’s, you can go to a bunch of makeup counters and sample eyebrow pencils to choose which one you like best. Use tinted brow mascara. Just like mascara for eyelashes, brow mascara (sometimes called brow gel) enhances eyebrows by coating individual hairs, making them appear longer, darker, and more defined. Pick a gel that’s closest to your natural hair color, and brush it on going from your nose to your arch. Brow mascara also works to shape your eyebrows and keep them in place all day. Prepare your canvas. Before applying any makeup, your face should be cleaned, moisturized, and dried. If you wear a full face of makeup, make sure the following steps are finished before starting your brows: Begin with a layer of makeup primer. Primer will prevent your makeup from smudging and help it to last longer. This is extremely important when trying to maintain the illusion of natural eyebrows on bare skin. Sponge on a light layer of foundation. Follow up by adding concealer to any problem areas you want to cover up. Blend well with a makeup sponge or your fingertips. Many people use only bronzer or only blush, but if you use both start with the bronzer. Once these elements are ready, you can move on to drawing your brows. Use a pencil to add individual “hairs.” Use a black-brown eyebrow pencil sharpened to a fine point. 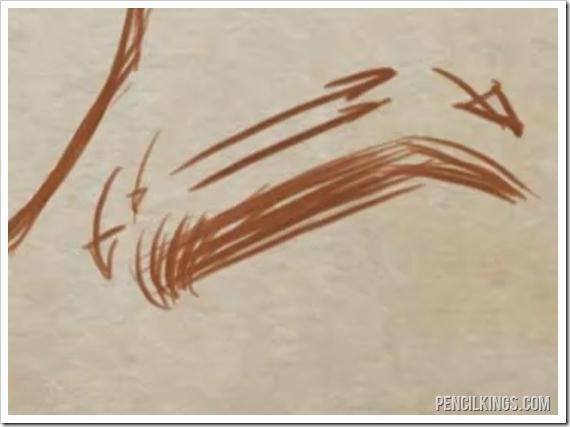 Draw small lines from the bottom of your eyebrow outline feathered away from your nose. 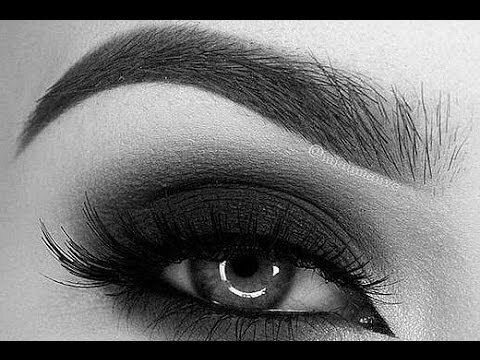 A few stray “hairs” that don’t perfectly line up with your brow outline will keep your eyebrows from looking too perfect and more like real eyebrows. You probably don’t need to draw on your eyebrows if they’re that bushy. You can brush your eyebrows up and carefully trim them with nail scissors to reduce the bushiness. It depends on your particular preference. You can ask a professional at your local store for assistance in picking one out. Can I dye my eyebrows with regular DIY hair dye from the store? Get a thin razor and go along the out sides to shape them. You could also get them professionally done. Avoid overextending your eyebrows’ tail. Hold an eyebrow pencil from your nostril diagonally to your brow. The point where the pencil intersects with your brow ridge is where your eyebrow should end. 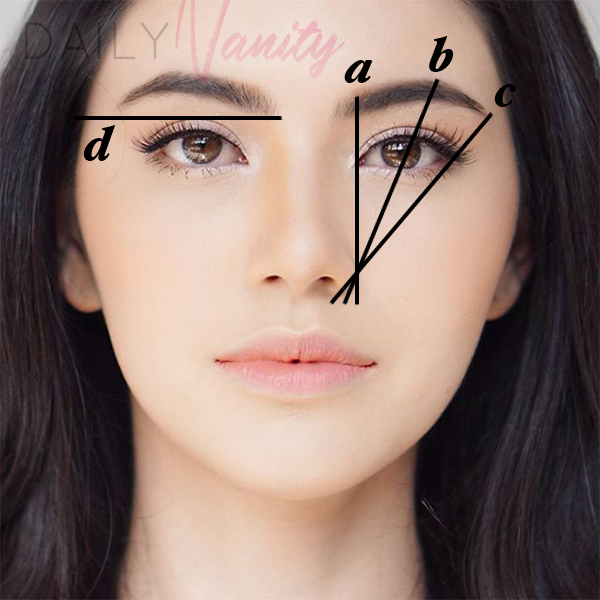 Extending beyond this spot will make your eyebrows look less natural. Brush on a thin layer of cosmetics lacquer or sealant over your new eyebrows. The sealant will keep your drawn on eyebrows smudge free for up to 24 hours. If you find that the sealant gives your brows too much of a shine, add another dusting of translucent powder. The powder will mattify and remove the sheen. It depends on how dark your skin is. If your skin is lighter, use lighter brown, if your skin is darker, use darker brown. When you are finished, compare both eyebrows straight on to ensure they are fairly symmetrical. Don’t worry about any minor differences as no one’s natural eyebrows match perfectly. If you’re having trouble freehanding your eyebrow’s basic shape, try using an eyebrow stencil as a guide. These tools are widely available at most stores that carry cosmetics. If you are trying to achieve a natural look, avoid creating sharp angles or boxy points. 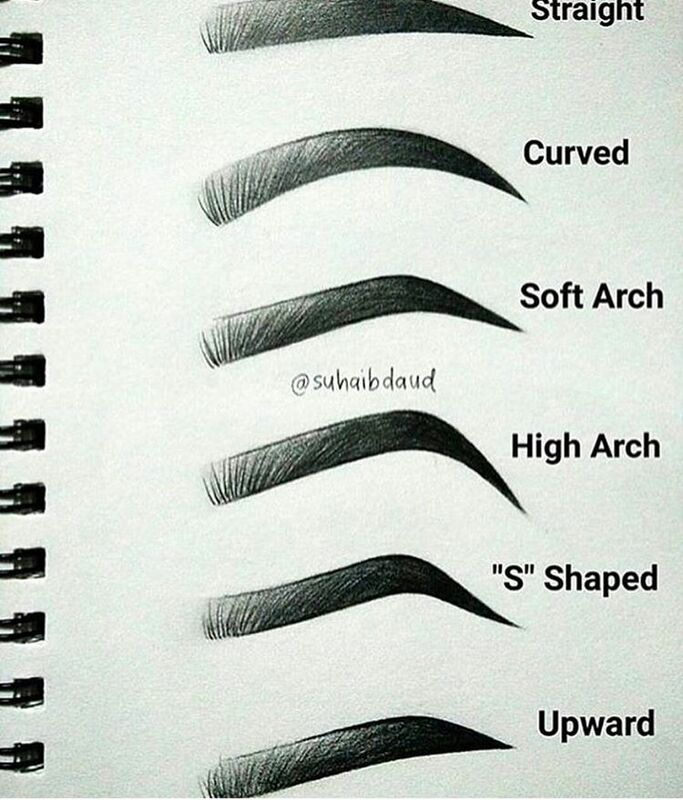 If your eyebrow’s natural arch is quite dramatic, however, you shouldn’t smooth it down. This video gives a good tutorial on finding your ideal eyebrow shape and then filling in the brow with pencil. 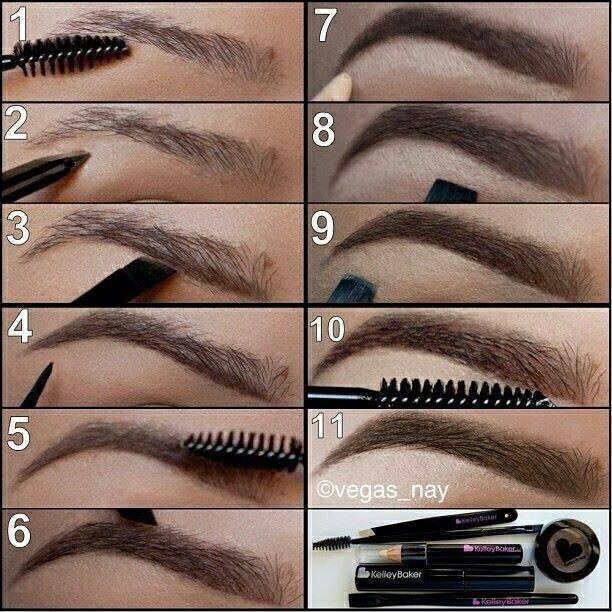 Brush eye shadow onto your eyebrows. Lightly load an angled cosmetic brush and drag it along your brow. 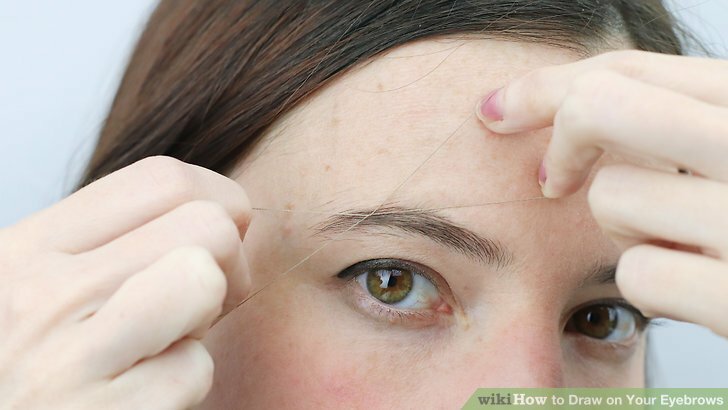 Start from the outside edge and move in towards your nose against the hair grain. Unlike when you’re working from scratch, eye shadow here is meant to create the illusion of thickness with your natural brow hairs. You will be working with a much lighter shade here. If your skin is pale and your hair is light, use a neutral taupe. If your skin and hair are darker, use a neutral dark brown instead. Go slow, and make small strokes. Try to get a natural shape and get an eyebrow pencil that could mimic hairs. Create the basic shape with the eye shadow mix. 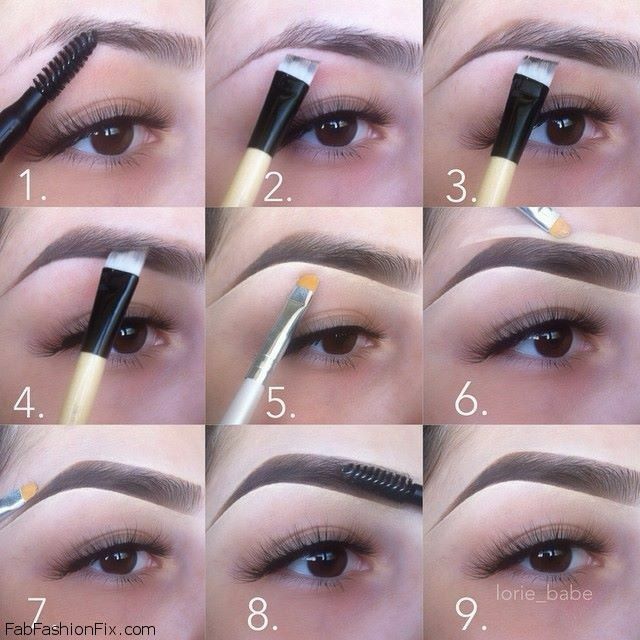 Use a small slanted makeup brush to form the base of your eyebrow. 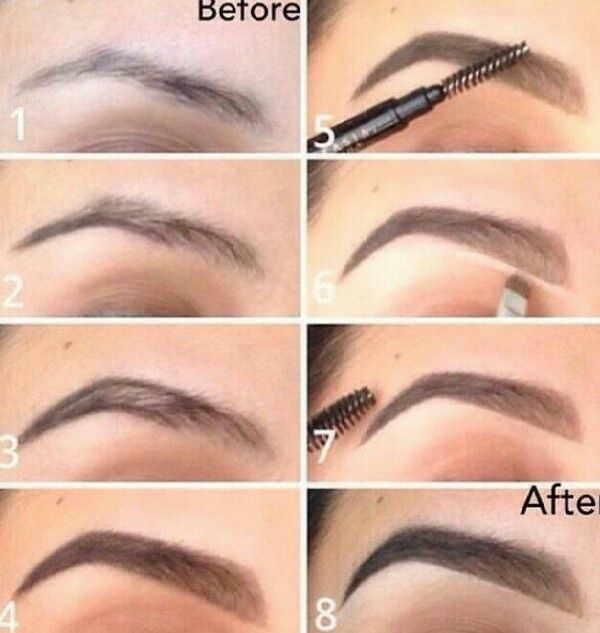 Use your brow ridge as a guide for your eyebrows’ shape. 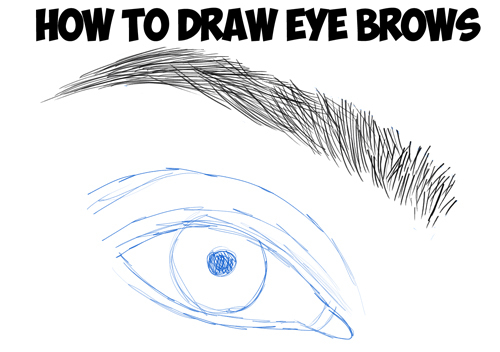 Drawing drastically away from your brow ridge will make your eyebrows look less realistic. Otherwise, you can experiment with different shapes before deciding which looks right for you. If you don’t have a small enough makeup brush, you can use a cotton swab instead. You should try to get a color close to your hair color. If you have lighter hair, you should use a light shade of brown. What if your eyebrows are bushy and you can’t see a natural shape? Mix black and brown eye shadows together to closest match your current hair color. You will be using this mixture to draw on the base of your brow. A combination of black with one or more shade of brown tends to look the most natural. A little bit of black powder in a light brown mix will make the lighter shade look more convincing, while some brown will soften the harshness of pure black. Fill in patches. Many people have small bald patches within their eyebrows, but chronic over-tweezers may find them particularly worrisome. Use an eyebrow pencil or dust on powder with an angled brush. Pick a pencil or powder that is close to the same shade as your natural eyebrows. Layering with both can create a more natural look. 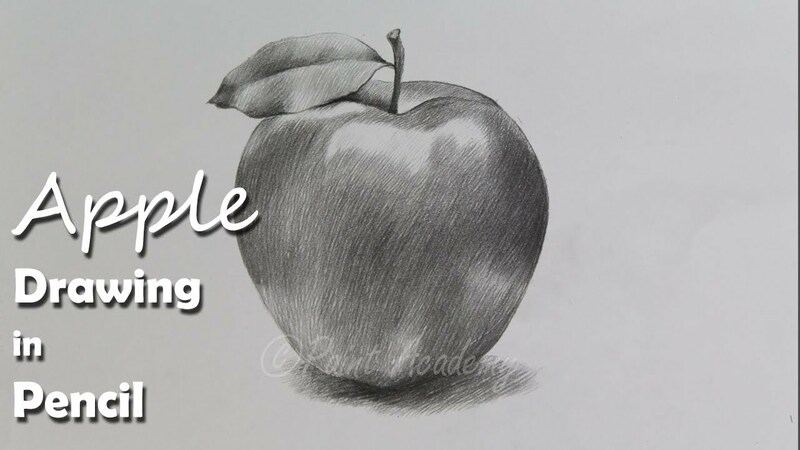 When using a fine pencil, fill in with multiple light strokes to mimic the look of individual hairs. Delicately brush off excess pigment with a clean makeup brush. Add another layer of pigment and do another brush-off. 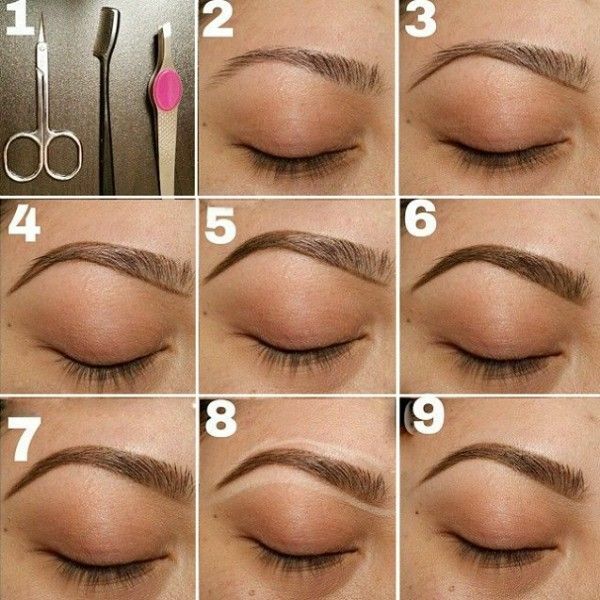 Repeat this process until your eyebrows are as dark as you’d prefer. Set your brows with gel to keep the makeup from rubbing off as you go about your day. Grow them back. The first thing you should do to fix over-plucked eyebrows is to stop plucking and waxing. The best way to achieve a good brow shape is to let them grow out for about a year or so. Using a brow razor to shape will help stimulate growth. If you absolutely can’t stop tweezing, let your brows grow for at least three weeks before plucking again. Too-frequent plucking can damage your follicles, causing permanent damage. Yes, but the results often do not turn out well. There are more expensive eyebrow dyes you can order that work much better. It might be better to just fill your eyebrows in with a temporary filler. Define your main brow shape with an eyebrow pencil. 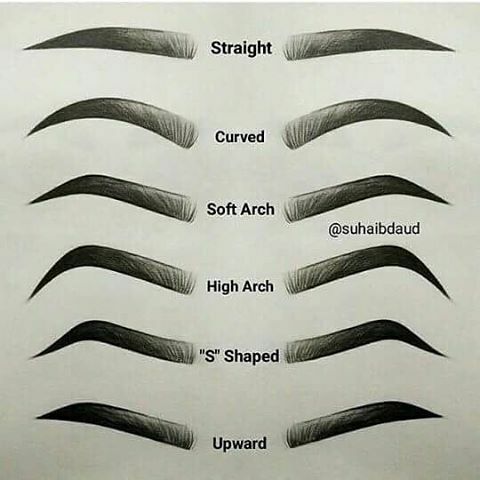 Use your existing eyebrows as a guide when determining a shape. Fill in your brow using small, light strokes until you’re happy with your eyebrows’ shape and thickness. It is very important to match your brow pencil closely with your hair and complexion. Try to find one that is close to your natural hair color but a few shades darker. If you dye your hair, it may look more natural to match the hair on your head rather than your existing brows. Eyebrows frame the face and are an important part of how we express emotions. Because of this, subtle changes to their shape and color can drastically impact someone’s look. 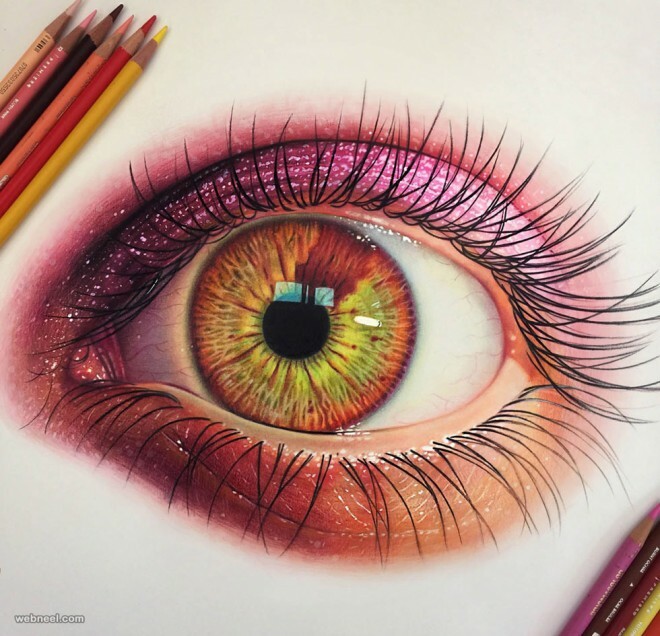 Whatever your reason for drawing on your eyebrows, there many different techniques you can use to achieve the perfect look! Keep your eyebrows well-shaped. Even if your natural brows are all but invisible, it is important to keep them well-groomed. By keeping your eyebrows professionally shaped, you will have more definition to work from. Wax or thread them on a regular basis. 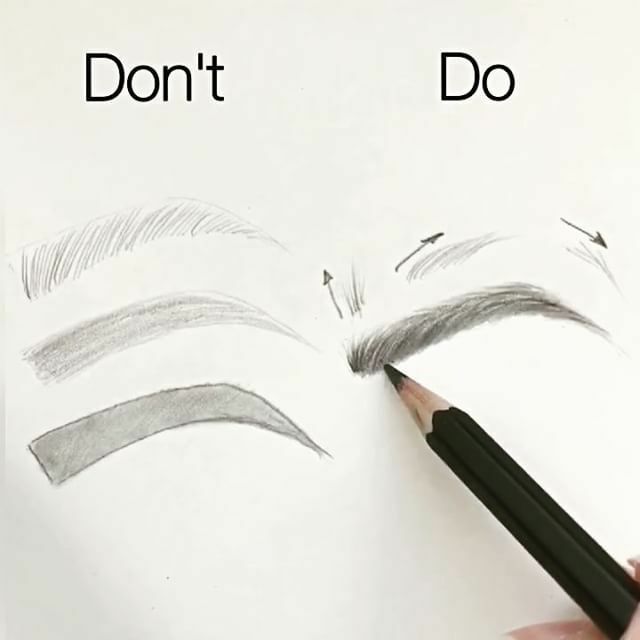 Even if you aren’t happy with your natural eyebrow shape, try taking as many cues from it as possible when drawing on new ones. 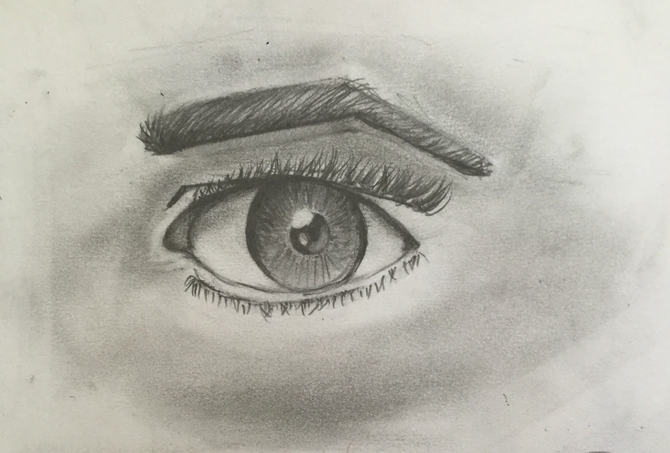 Drawn on eyebrows based on real brows will look much more natural than brows created freehand. My eyebrows are so light and sparse that it looks like I have no eyebrows, help?